Hidden People Limited, 9781908704009, 148pp. Stories of people in confidential conversations. Dialogues between couples, whether two males, two females, male/female, old/young, couples, strangers, people and TVs or two dogs. On love, loss, hope, impropriety, friendship, death, anger, joy. Some are humorous, some fierce, most emotionally resonant. The talks occur in bars, in living rooms, in hospital waiting rooms, on building ledges, dentist chairs, therapists' rooms, rest homes, usually face to face, rarely on phones. Always intimate. A type of storytelling that's called a character piece and is meant to convey a mood or idea. 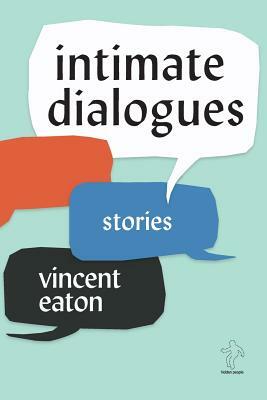 They are intimate, and much of the intimacy is revealed through dialogue. More like 3 minute pop songs. With as much emotion and fizzle as possible, as quickly as possible.